I bought a packet of mulberry fruits from a super market some days ago, and found them very appetizing. I call it the "silk fruit" because it's the plant that the silk worms eat to make silk. The mulberry fruit is also called a multiple fruit. Immature fruits are white, green, or pale yellow. In most species, the fruits turn pink then red while ripening, then dark purple or black and have a sweet flavor when fully ripe. Most importantly, a 100grams of this fruit provides just 43 calories, and so can be a good option for weight watchers. This fruit is rich in phenolic flavonoid phytochemicals called anthocyanins which prevent cancer. Also, they help in controlling blood pressure, diabetes and bacterial infections. Mulberries act like anti aging agents as they are rich in vitamins such as A, C and E. For those with low hemoglobin, this wonderful fruit can improve its levels. 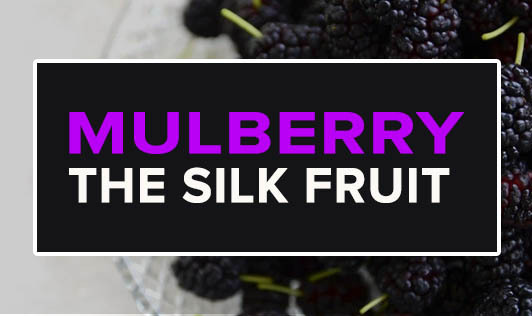 Where can you include mulberries? • It can be an addition at your breakfast table with you cereal. • It can be consumed with low fat curds. • Mulberry jams and muffins are very tasty and can be included in your evening snacks, provided they are not made with too much sugar. • Mulberry, in its raw form can be eaten as a mid morning snack. • It can be used as a cake topping or to make jellies and syrups. • It can also be mixed with other berries and eaten as a berry salad. Though this fruit is not very popular here, whenever you can get hold of them, I am sure you wouldn't want to miss buying this delightful fruit!